I know that the advent calendar is a big deal in MANY homes across America. What a great way to slow down and savor the special moments before Christmas. What I don't know is how widely used the advent wreath is. Is this just a Catholic and Lutheran tradition/custom? Do you use the advent wreath in your home or just the calendar? If it's not a tradition in your home maybe you'd like to start a new one. 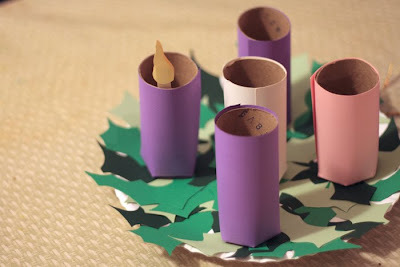 And here's an easy way to make an advent wreath that the kids can help light! Although blowing out these candles may prove a bit tricky at least we don't have to worry about anyone getting burned! Here's some basic instructions for making your own! glue or double sided tape as I used. You will need three purple candles, one pink and one white (although the white one is optional). 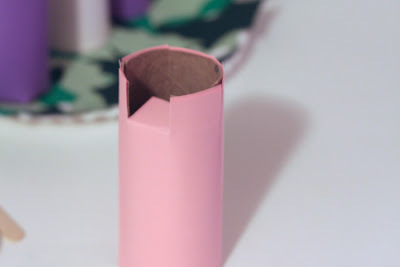 Cut the paper to fit the toilet paper tubes. 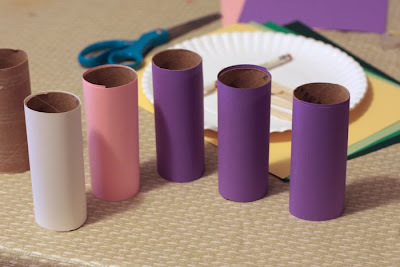 Glue or tape the paper onto the tubes. 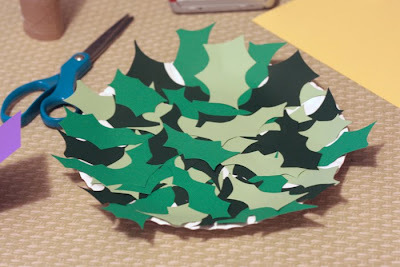 Cut the green paper into the shape of evergreens or holly leaves. Glue or tape to the paper plate. I noticed after the fact that my tubes were longer than my popsicle sticks so I had to get creative. I cut slits into the bottom of the rolls and folded them in. Then I used the folded in part as my base to tape to the paper plate...so my mistake actually made it easier to attach the candles to the plate. 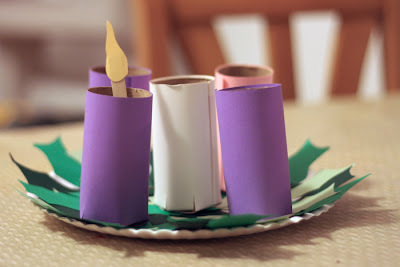 Attach the purple and pink candles to the outer edges and put the white "Christ" candle in the middle. 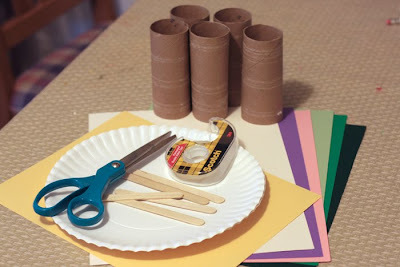 Cut out 2 matching flames for each popsicle stick and glue or tape them on. Then you're all set and ready to let the kids light the candles for Advent! I'd love to see your version of this...leave me a comment and let me know where I can see yours! I found this helpful information about advent wreaths on Wikipedia. In some traditions the first candle is called the prophet's candle and is meant to signify the hope of Jesus' coming. The second is called the Bethlehem candle in honor of the city of Christ's birth. The third candle is the shepherds' candle. The final candle is the angels' candle, symbolising the angelic proclamation of joy at Christ's birth. A number of carols have been written for use with the short liturgy accompanying the lighting of the Advent candles in church services. A common format is to add an extra verse each week, relating to the symbolism of that week's candle. Looking forward to hearing the announcement! Found your blog via the Good Morning girls post. I love this idea to use with my young kids, as they are too drawn to the flame of a real candle! My husband and I were raised Catholics, but we never practiced Advent or the wreath, etc. This is the first year I decided to do this with my kids. There are so many great resources and studies, ebooks, etc. on the subject. I bought a wreath, garland, and 5 white candles in tall glass jars from the dollar store. I plan to write out each weeks theme on each candle (hope, joy, etc.) and leave the center candle white for Jesus. I think I'll use your idea here for my youngest kids. Thank you! And P.S. I love the picture banner at top of your page! The kids are adorable and I love their shirts! Too cute!